↑ Although it was almost always defended in Florida, the NWA Florida Heavyweight Championship was given to Steiner by Mike Rotunda while working a storyline together in Jim Crockett Promotions in December 1987. 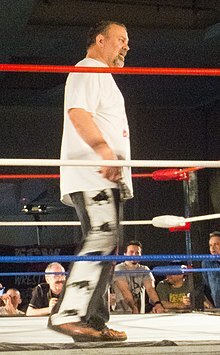 Steiner was stripped of the championship so that it could be defended in the Florida promotion exclusively once again in December 1988. ↑ Steiner's reigns with this championship occurred after Ted Turner purchased Mid-Atlantic Championship Wrestling from Jim Crockett, Jr. in November 1988 and renamed the promotion World Championship Wrestling. The reigns also occurred prior to the title being renamed the WCW United States Tag Team Championship and while WCW was still an NWA affiliated promotion. ↑ After Buff Bagwell abandoned Steiner during the championship match, Steiner chose Kenny Kaos as a replacement partner to hold the championship with. After Kaos suffered an injury, Steiner chose Bagwell's mother Judy as a replacement partner to hold the championship with. WWE recognizes this occurrence as one continuous reign for Steiner. ↑ The Steiner Brothers won the tournament in 1990 when Mid-Atlantic Championship Wrestling was bought by Ted Turner and renamed World Championship Wrestling, but prior to WCW's withdrawal from the National Wrestling Alliance. ↑ This Mid-Atlantic Championship Wrestling, while currently operating out of the same region of the United States and having revised some of the championships used by the original Mid-Atlantic Championship Wrestling, is not the same promotion that was once owned by Jim Crockett, Jr. and subsequently sold to Ted Turner in 1988. It is just another NWA-affiliated promotion. ↑ 1.0 1.1 1.2 1.3 1.4 1.5 1.6 1.7 1.8 "Rick Steiner". Online World of Wrestling. สืบค้นเมื่อ 2011-01-16. ↑ 2.0 2.1 "Rick Steiner's official MySpace". ↑ "About Broadus/Steiner Group at RE/MAX". ↑ "STEINERS, HENNIG AND MORE HEADLING 2014 NATIONAL PRO WRESTLING HALL OF FAME INDUCTIONS - PWInsider.com". ↑ "Rick Steiner's first WCW United States Heavyweight Championship reign". ↑ "WCW United States Tag Team Championship history". ↑ "Most Absurd Champions Ever, page 3". ↑ "NWA Mid-Atlantic Tag Team Championship history". ↑ "PCW Tag Team Championship history". ↑ "PWA Tag Team Championship history". ↑ "Pro Wrestling Illustrated's Top 100 Tag Teams of the PWI Years". Wrestling Information Archive. Archived from the original on September 21, 2011. สืบค้นเมื่อ 2009-03-10. ↑ "Pro Wrestling Illustrated Top 500 - 1991". Wrestling Information Archive. Archived from the original on June 7, 2008. สืบค้นเมื่อ 2009-02-14. ↑ "Pro Wrestling Illustrated's Top 500 Wrestlers of the PWI Years". Wrestling Information Archive. Archived from the original on June 16, 2008. สืบค้นเมื่อ 2010-09-15. ↑ "Pro Wrestling This Week". Superstars of Wrestling. Syndicated. WATL, Atlanta, Georgia. ↑ "Independent Wrestling Results - March 2006". onlineworldofwrestling.com. สืบค้นเมื่อ 2008-07-04. ↑ "UWF World Tag Team Championship history". ↑ "WLF Heavyweight Championship history". ↑ "The Steiner Brothers' first World Tag Team Championship reign". Archived from the original on October 22, 2012. ↑ "The Steiner Brothers' second World Tag Team Championship reign". Archived from the original on October 22, 2012. หน้านี้แก้ไขล่าสุดเมื่อวันที่ 3 มีนาคม 2561 เวลา 18:16 น.